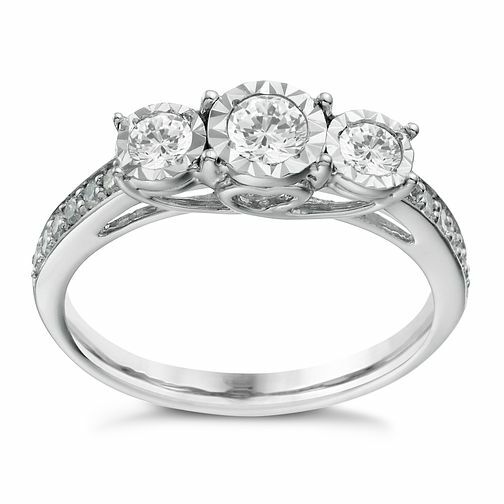 9ct white gold 1/2ct diamond 3 stone illusion set ring is rated 5.0 out of 5 by 2. Rated 5 out of 5 by Anonymous from Absolutely stunning! As has been said the picture really does not give justice to how amazingly beautiful this ring really is! My boyfriend proposed almost a year ago and I still am totally in love with the ring and it still looks just as amazing now a year on. I still get compliments about it regularly. It shines amazingly in all lighting. I couldn't have made a better choice myself! Rated 5 out of 5 by Anonymous from Picture doesn't do it justice! My fiancé got me this ring this year before the anniversary we got together due to my other ring bent! (not from Ernest Jones) h.samual which I had tons of problems with and felt very judged and were bit snobby. Ernist Jones we saw the manager who showed us some rings and was polite lovely and just down to earth! Even had a laugh! But back to the ring. It's honestly fab! Beautiful! Diamonds are completely secure something h.samual have problems with a lot! The ring is solid and shiny I just love looking at it! 5* ring. Also it's a nice size. Elegant but not tiny!